Ginny is a 6.5 month old, 30 lb. 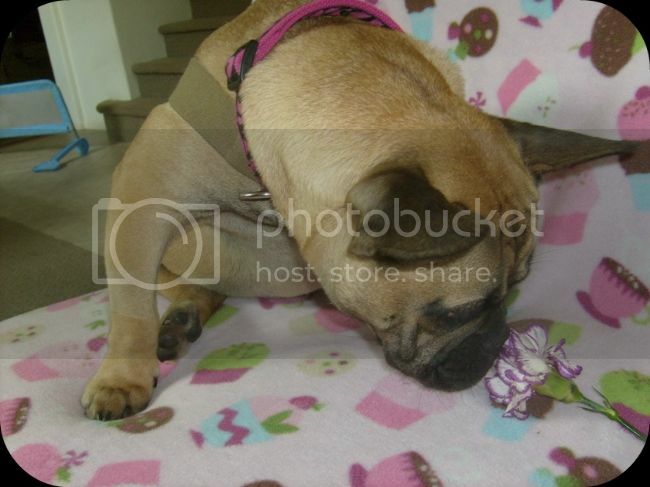 puppy being fostered through the French Bulldog Rescue Network. Ginny has both neurological and orthopedic issues that she was apparently born with, resulting in incontinence and splayed rear legs. She was relinquished by a shelter in Northern CA when she was 4 months old, and is currently living in Southern CA with her foster family. Ginny has been spayed already (by a board-certified surgeon due to some abnormalities) and will undergo yet another surgery on May 23rd. 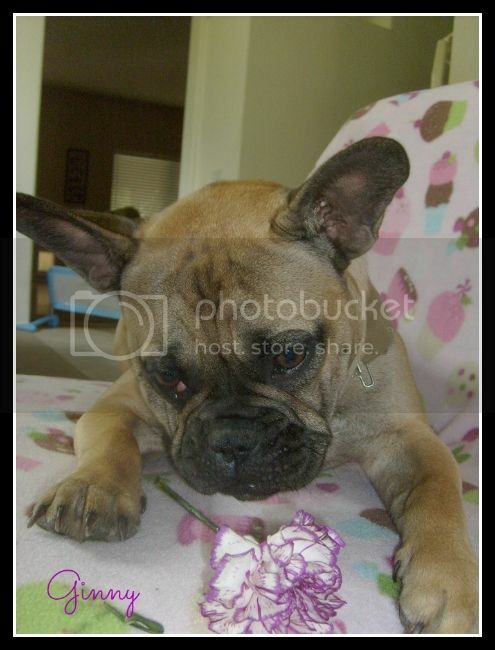 She will have a cherry eye tacked, and will have a bilateral femoral hip ostectomy. 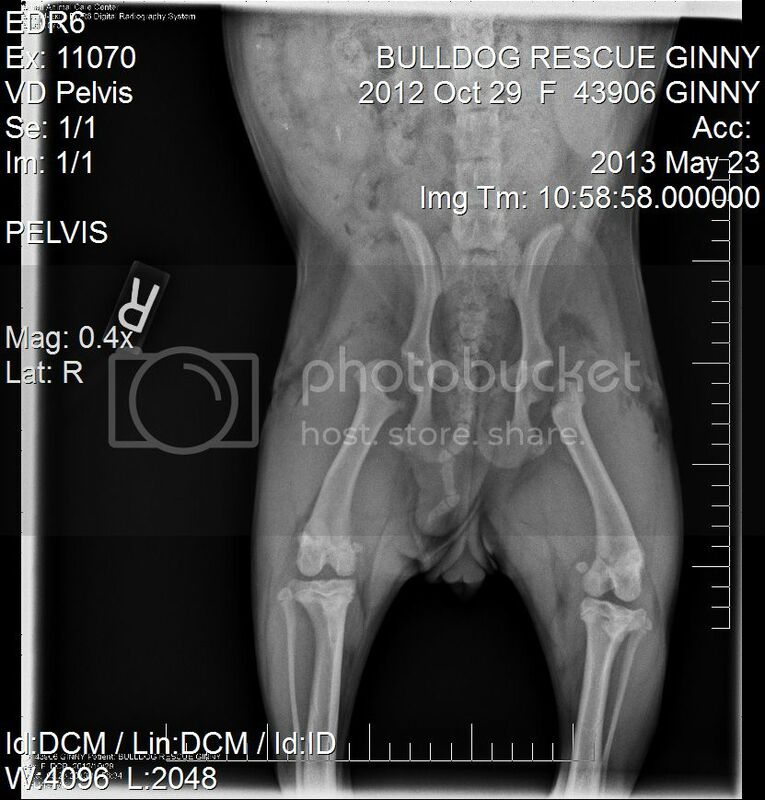 (Ginny's hip sockets are shallow and malformed, so the ends of her femurs will be removed to prevent the bones from rubbing together. The resulting scar tissue will create an artificial hip joint.) It is unknown if the surgery will help improve her walking skills, but it should help alleviate pain. Ginny is a typical pup....she loves to lay in the sunshine, dig in the dirt, play with toys and with her foster brothers, and visit the dogpark. She is a determined girl who doesn't know she's handicapped. She has even taught herself how to scramble up the doggy steps onto the couch. 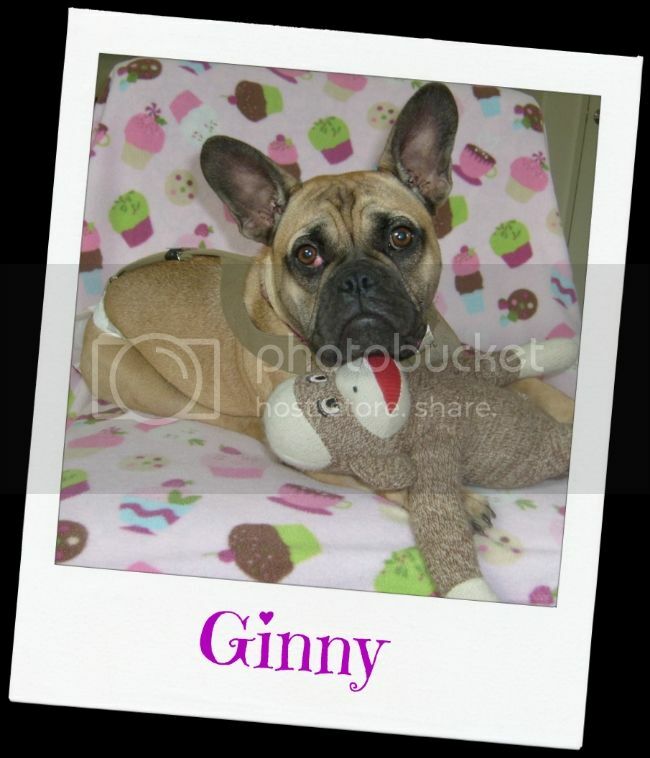 Ginny is an amazing pup whose untraditional looks keep everyone smiling. 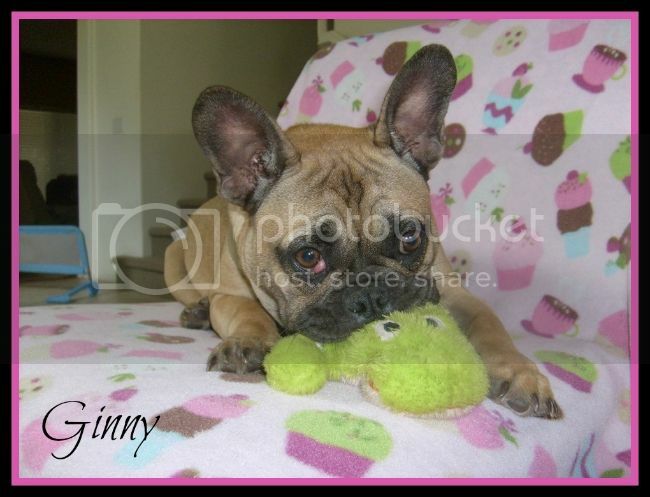 Ginny had her bilateral FHO and cherry eye repair yesterday, and is recovering. 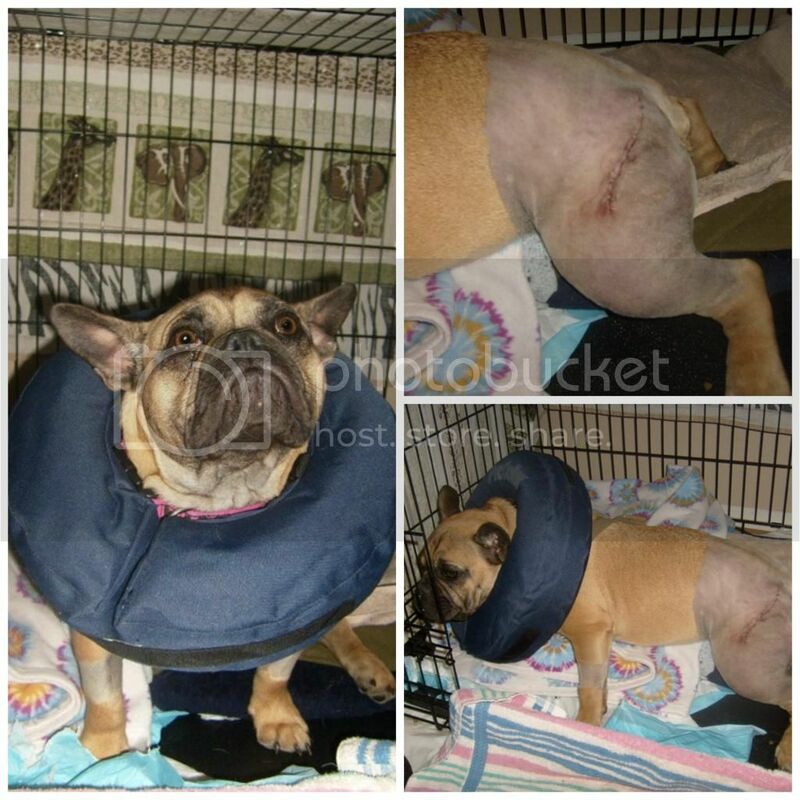 Once she's back up on her feet and is able to walk again, she will be ready for adoption. Ginny is finally ready for adoption! Please share her story so that we may find her a forever family. Awww...that's wonderful! You did so much for that little girl.